Some people have fun, creative, inspiring wardrobes. Lindsey even documents hers every week. I am not that girl. I don't wear prints. Ever. I crave comfort and simplicity over style. I love me a gorgeous necklace, feel strangled by bracelets or rings, earrings make my ears feel like they are on fire. I wear flip flops all year long. Even in the rain. Some people buy purses, boots, heels. I buy Havaianas. It's sort of a sickness. Join me in a typical week. Me and my rainbow parade of flippy floppies. Celebrating our 12th anniversary with a beach nap. Cali casual at it finest. My weekly time in the dentist chair. Staring at the laughing gas that isn't included in obscene amount of money that I paid. Pretty sure they should have thrown it in for free. Four appointments down. Six to go. 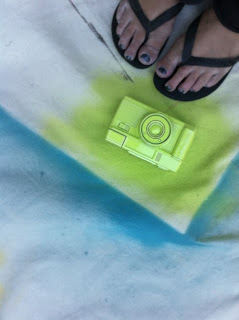 Yes, I have Havaianas that I wear specifically for spray painting. They are my first pair and they have seen better days. Plus a lot of paint. Visiting Llamas with Meg and Amy. 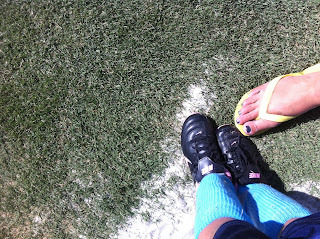 My inaugural day as a soccer mom. in the world that you would want to be wearing. 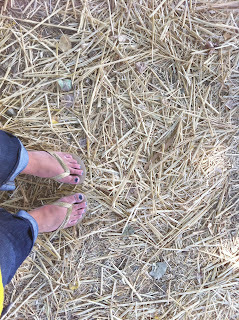 What have I learned by documenting this flip flop adventure? I wear my capri jeans too much. This isn't all of them. What is your one signature item/ addiction? I dare you to photograph it for a week. Guaranteed to make you feel like a dork! But not dorky enough to make me give them up. Although I did wear my TOMS today. In my attempt to pretend I am a stylish young hipster. Cute toes! I just found a couple pairs of havaianas at a Bealls outlet for $2.99 and $3.99 each so i decided to give them a try. I LOVE THEM. I have the bright blue ones you have and black ones. -flip flops and dirty africa toes. -sometimes a sweater, if i want to spice things up. I could've written this post. I used to work at Abercrombie...we'd wear flip flops in the snow. In a few months I'll say the same thing about the Uggs I wear every day. Reefs. Six pairs. LOVE them! 1. You seriously need some fabric flowers for all those flippies. 2. What's with spray painting the camera? 3. I know you posted about it but I can't remember.. what's up with all the dentist visits? 4. This reminds me, I need to go buy nail polish remover after work. I'm the same way. Flip flops every day- year round. jeans. solid color t shirt. no jewelry- it makes me feel weird. I'm the definition of plain jane. oh this was a fun post! You are california casual at its finest. :) Me likey my havaianas a lot too, I only have 1 pair, but they are the first thing I slip into when I get home, and they stay on until I go to bed! i will start this challenge next week...also, i'm intrigued by the fact that we have matching second toes. things that make you go, hmmmmm. julie, you crack me up! 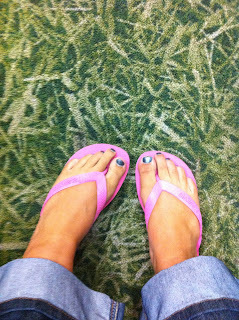 i wish i could wear flip flops all year long!!! Oh my! I am just the same always jeans and a solid color tank top but I don't have nearly as many flip flops! I am insanely jealous! you are such a piece-of-work! i love your "dorkiness"(if that's what you want to call it, i call it style;)! i also started listening to Mumfor and Son's radio(on Pandora) SUUUUUPER gooood! you rock. ditto! i wear my capris all the time and it looks like you have the same ones - merona? but i will admit i only have one pair! i finally had to buy "fit flops" this year as i started to have foot problems and those are the only flip flops endorsed by the podiatry association. i will say since i've had them my little pains have gone away! hee! i love it! I love flip flops, I mean love, although I'm more of a Reef girl myself- men's reefs in particular (cringe, I know) but that means serious upkeep for my feet and I'm lazy. and that means lots of flats and boots :) I think my obsessions is scarves, but it's not cold enough here to don one everyday, soon though, soon. HA this post is a hoot! ok...first of all what color are your toenails? Love them! My signature outfit is a pair of boyfriend jeans that I bought from tj max for $10, a gray or white tank top or v neck t shirt and white leather flip flops from AE. Debating getting some silver sparkle toms...which ones do you have? Ok so I too have a flip flop addiction! Have you ever tried Yellow Box, they're my new fav. Which style havaianas do you wear? Bc I got a pair and they (the straps) are SO wide my foot slides out! And I have SUPER wide feet! I love necklaces too!! I have one of the petal drop from Lindsey..my new fav :) I am dying for a rosette one though! Oh my Heck!!! You crack me up Julie!! 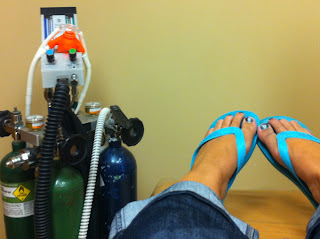 My favorite picture is with you (ahem, your feet) and the laughing gas tanks...love it! Now, you have me thinking...what would I photograph!?! Just a thought to share...I follow Betty Crocker on Facebook and they posted a group pic of you at their "Baking with Betty"
They remind me a lot of the ones from Old Navy...are these superior? They have a beautiful website! 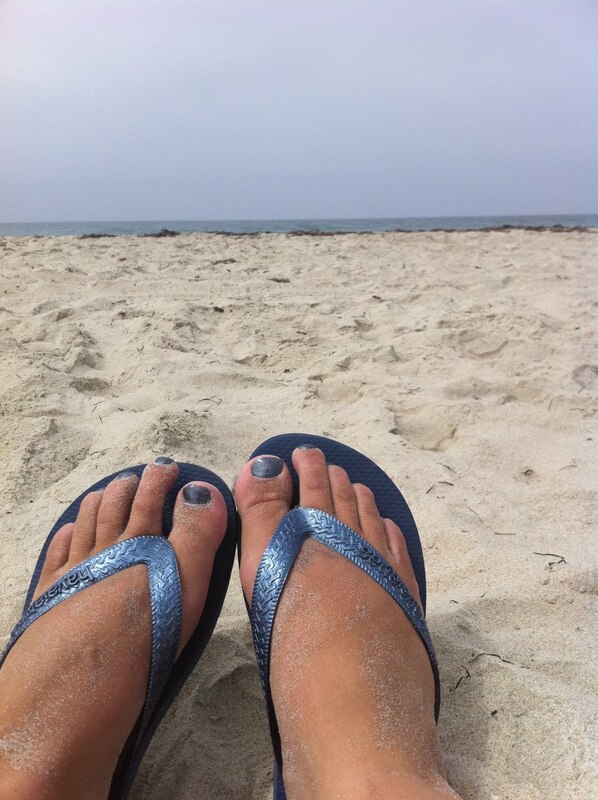 i'm a flip flop girl, too. wait, is that different than havaianas?? i don't know, but i even wear mine sometimes when it's snowing. i do wear a lot of ballet flats, too though. i feel the EXACT same about jewelry. i want to move next door to you. seriously. Would love to know what you're doing with the camera! My feet look like yours everyday . . . anytime I leave the house . . . except mine have Reefs on them. I just don't feel like cute shoes look cute on me. I think they make me look like I'm trying too hard :) I'm addicted to jersey knit skirts from Old Navy right now. I have like 10 in 5 different colors and I just rotate them. Oh and cardigans - always a cardigan. I seriously have an issue with v-neck t-shirts. It all started in high school when I wore Hanes mens white t-shirts every day. Except I am short and big busted so the v-necks are always too low so I wear a tank under them. I will definitely take a picture every day this upcoming week because it is a little insane. Even my dresses are v-neck. My signature addictions are Rainbow Flip Flops and Headbands, ok, and Lisa Leonard Necklaces. I actually texted Erin before the Just Spotted Awards...she made me a headband and brought it to the event..talk about addictions. I was a little worried when I got here and saw the title of your post, but you ROCKED WIWW! well, naturally. 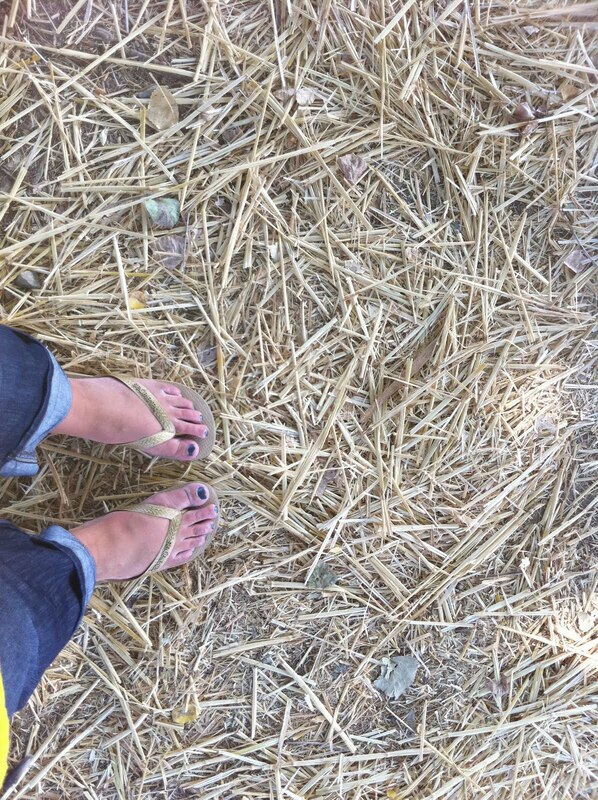 tom's are the autumn equivalent of havaianas anyhow! yeah, i wish i could do the same post, but it would be too much copycatting. cause my signature item is flips too. except mine are usually old navy...with a few j.crew splurges mixed in for dress-up days! This is hilarious. I'm the same way! Even when I lived in Missouri, and not Sunny Cali, I ALWAYS wore flip flops. Mine are all Old Navy, and sometimes when I'm at church I wonder if people pity me because I can't afford real shoes :) Ha. WIWW scares the crap out of me...a week of my jammies scares my kids I'll just keep that to myself! Although I am a flip flop gal myself, I am lame and go from brown to black with a dash of red TOMS. Oh and PS not wearing those ADORABLE Holla shoes is a crime. PSS It's only 11pm, look at me! I too, wear my flip flops everyday...and yes! even when it rains. thank goodness we live in cali and don't see that very often. but i think i will try to document something for a week that i am obsessed with...great challenge, thanks!! Funny enough my 5 year old and 2 year old both LOVE their havaianas. They are the most comfy flippies for their little feet. Really light weight and soft. They actually stay on better then rainbows, Old navy, or Roxys. Rainbows tend to be a bit heavy, Old navy's tend to be to stiff, Roxy now make their flip flops with the strap out of really hard think plastic ( instant blisters between the toes, OUCH). Funny enough I have yet to try a pair. 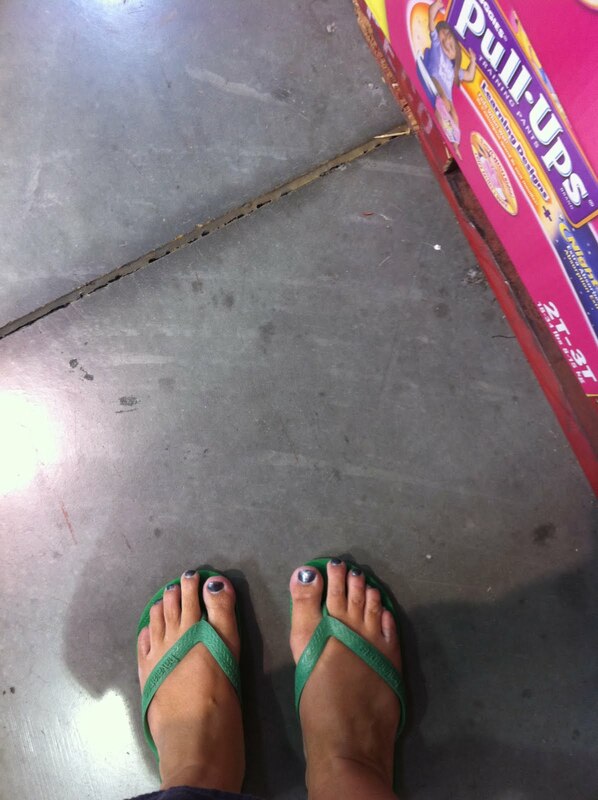 I just wear whatever flips I can dig up.. matching or not :) And yes.. feet with the canisters was the best picture! So cute! Life's too short to not be comfy as much as possible! And I think I have those same capris (if they are from Target) and I live in mine too. Also- been wanting some Toms- do you like them? I am style challenged to say the least...so I watch what not to wear and take notes. Thus I bought a pencil dark denim skirt this year. Anywho, every time I grab my flip flops I remember Stacy and Clinton swearing about flip flops. Then I smirk and wear them anyway. I love my havaianas too. I bought 7 pairs when I was in Brazil last spring (Some were presents.) I should have skipped buying them for my kids and bought myself another pair. In the winter it's Blundstones for me...with everything. I wear silver earrings too much. I have several pair but I end up wearing the same ones all the time anyway. And I lived in my cheap, silver flip-flops this summer. I have always thought I was the only person on the planet with a short, fat big toe and long skinny other-four-toes. Now I know I am not alone. We must have been separated at birth. i *love* your version of wiww! it totally made me laugh!